"Mr Stink stank. He also stunk. 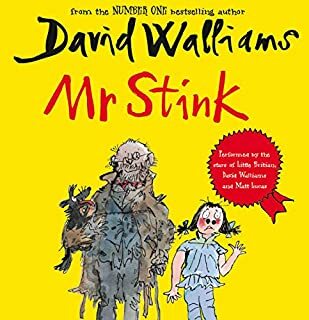 And if it was correct English to say he stinked, then he stinked as well….” Chloe sees Mr Stink every day, but she’s never spoken to him - which isn’t surprising, because he’s a tramp, and he stinks. But there’s more to Mr Stink than meets the eye (or nose), and before she knows it, Chloe has an unusual new friend hiding in her garden shed. The Most touching book I have ever read! The reading was great, the story fine for little ears, but I wouldn't recommend it for a road trip. a bit too much for the parents to endure.